Le côté Dali de la déco.Une ambiance chaleureuse dans un esprit familial.De plus, à l'accueil le personnel parle français et m'a également indiqué des 'bons plans' pour des restaurants autour de l'hôtel. L'Hotel Plaza Inn se trouve dans le centre de Figuières, à seulement 100 mètres du musée Salvador Dalí. Il dispose d'un toit-terrasse avec une vue magnifique et de chambres climatisées avec balcon privatif. Les chambres de l'établissement Plaza Inn sont dotées d'une décoration moderne, avec des œuvres d'artistes locaux. Chacune comprend une télévision par satellite, une connexion Wi-Fi gratuite et une salle de bains privative avec sèche-cheveux. L'hôtel abrite un bar et des paniers-repas sont disponibles si vous prévoyez de partir en excursion toute la journée. Des services de massage de blanchisserie sont assurés. Le parc Bosc est situé à seulement 150 mètres de l'hôtel. Avec un bon accès à l'autoroute AP7, l'établissement Plaza Inn est installé à 40 minutes en voiture de l'aéroport de Gérone. Accueil chaleureux. Parking ferme à proximité. De bons conseils pour des restaurants bon rapport qualité prix. Et surtout à côté du Musée Dali. Je le conseille. La courtoisie de accueil, et le charme désuet de cette merveilleuse et kitch, collection de tableau; sans oublier les figurines qui nous rappellent les bons moments passés au cirque. Le mauvais fléchage de la ville pour accéder à cet hôtel. La proximité avec le musée Dali comme le Centre Ville. La gentillesse de tout le personnel. La propreté de la chambre et la qualité de la literie. Un téléviseur très petit et l'absence d'accès à des chaînes étrangères. Le personnel à l'accueil, la décoration : des tableaux de tous genres dans la cage d'escalier, le hall, la chambre. Le très grand lit et le calme. Algo ruidoso. La cama no es demasiado cómoda. Vieil établissement qui aurait bien besoin de travaux de rénovation. le lit un peu trop dur! Deco original, calme bien qu'en plein centre. Personnel très aimable. Lit couple extra large :) Toutes commodités sur place, boutiques, restaurants, bars et Musée Salvador Dali a 2mn a pied. Pas utilisé voiture du weekend-end :) Je recommande sans problème ! Molt ben situat. Aprop del centre i del Museu Dalí. Decoració molt original i la terrassa superior a l'estiu ha de ser una zona per a treure'n molt profit. sobre todo trato del personal y del dueño..excelente ubicación. 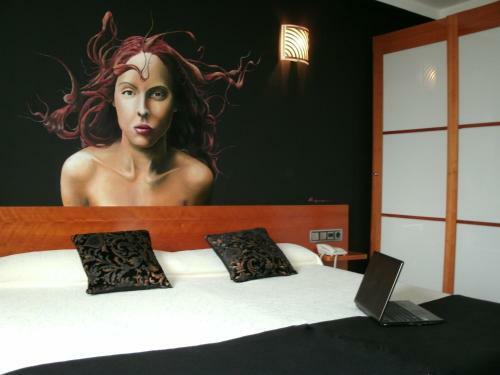 y decoración tanto en cuadros que es impresionante por todo el hotel como en la decoración del edificio que es sorprendente, divertida y única. la terraza merece punto y aparte. no la disfrutamos al ser semana santa y mal tiempo pero tiene que ser una gozada en las noches de verano. Vriendelijk, Goede Parkeer gelegenheid, Erg Hulp vaardig. Location, location, location. Decorations everywhere were fab. 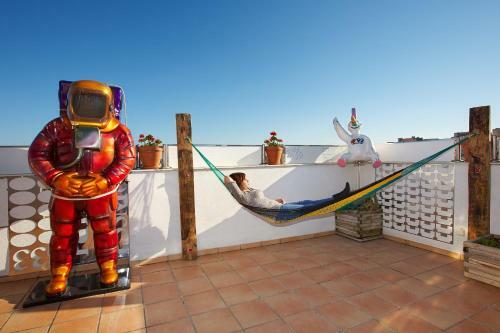 Our room, #203, had a giant Looney Tunes bunny on the balcony, with robot murals. Towels were not cotton and did not absorb. A/C not allowed except in July, when we asked the staff. Curtain fell off track, and we could see the hardware was about to come off the ceiling. Ubicación perfecta al lado del Museo. Todo muy limpio. Habitación muy cómoda. Decoración muy original con guiños al pasado (pinball en la entrada, numerosas imágenes de recreativas de la infancia) y estátuas de payasos y vacas (incluso en los balcones). Precio muy asequible. Volveríamos sin ninguna duda. Perfect place in the center of Figueras. Very nice Staff. 20 meters from Dali Museum ! Personalen var mycket trevlig och tillmötesgående. Bra och säker parkering. Tyvärr var WiFi närmast ej funktionsduglig under vårt besök. Wifi didn't work. Staff promised to fix it next morning but the next day it was the same. Wonder if it works at all. Stuff was really friendly, girl at the reception on 2.4 at 22m, recommended us a really nice tapas restaurant :) The hotel room itself was the cutest ever, loved it! The hotel was located right in the centre of the town. So everything was handy to walk to. The Dali museum was a two minute walk away. 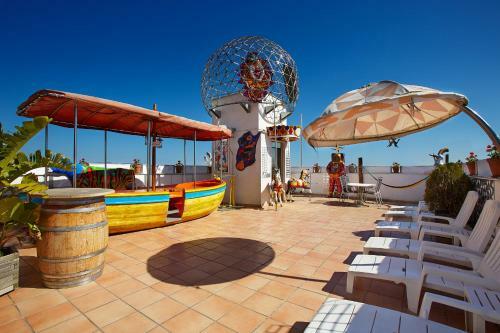 The hotel was a bit fun and funky, great rooftop views. The staff were very friendly and very helpful. We enjoyed our stay and extended an extra night. El trato del personal, teniendo en cuenta un contratiempo que he tenido. Aun que hagas las reservas con la tarjeta de crédito antes de alojarte en el hotel se pide el cobro por adelantado de la estancia. It is a very quaint hotel with a carousel animal in every window. Great pastry shop near hotel. This is a unique hotel appropriate in that it is a block from the Dali museum. The staff was super helpful with directions and dinner suggestions. It was a wonderful respite from the hub-bub of Barcelona. I'm sorry I didn't plan a 2-day stay with a jaunt to Cadaques. El wifi, en alguna zona desaparece, pero va muy bien. Perfectamente situado, personal muy agradable, habitación muy confortable/limpia y decoración realmente original. 100% recomendable. La ubicación, decoración muy original, la terraza. Muy bien ubicado. Las camas para personas de 2 metros. Personal muy amable. A dos minutos del Museo Dalí. Habitación limpia y amplia. Con paredes pintadas de jóvenes artistas. La cama enorme. Todo correcto. 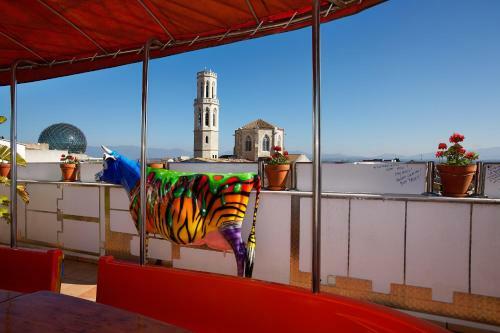 The style of this hotel is certainly a bit different with plastic cows decorating the balconies and all manner of objects in the reception such as a clown and a jukebox. So this hotel definitely gets points for originality! We thought the room was of a good standard and very clean. The location is also very good - it's almost next door to the Dali museum and everything else in town is within a short walking distance. I got the impression that the hotel aren't quite up to speed with general wear and tear in the hotel. There were a couple of things in our room (part of the cupboard for example) that were broken. But this is obviously a minor issue. Clowns are not my favorite thing, and to be greeted by one in the doorway was a little disconcerting--however, I recognize that the hotel wanted to distinguish itself (the hotel next door had carousel horses). The peculiar mismatched artwork everywhere was obviously purchased from garage sales--but it was amusing rather than off-putting. The room was fine, though somewhat noisy, facing the street. Make sure to get directions to the nearby open market for great prices on delicious fresh produce and that amazing serrano ham! The town is worth exploring, in addition to the Dali theater/museum. I had a room facing the street, which wasn't the best idea--plenty of traffic, and an active construction site across the way. The hotel was a little difficult to find in the old town, and parking, though free for the night, was a couple of blocks away. Handy location in town, friendly staff, free wi-fi. Can be noisy on street side. We spent only a weekend here. 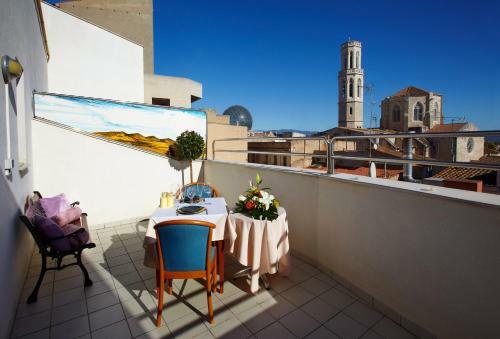 Is located in the city center of Figueras so you can visit all by walking. There are some paied parking places on the streets, the area is safe. I liked the huge bed. The decoration depends on the taste, was not my type, is too much I can say but is funny and changes your ideas. I apreciated the hand painted walls in the room. The breakfast had nothing special. Was a bit cold in the room. The hotel is fun. It is full of quirky , whimsical art including fiberglass figures and animals. They treat Saturday night guest to a free seafood bbq on the roof. It is comfortable and clean and the staff is helpful and friendly. They need to pay more attention to the small details. We were charged for 2 days parking, but the ticket they gave us was only good for one day. There was a missing hair dryer in the bathroom and the wire was just taped off and left hanging. The first tv remote we were given didn't work. The safe in the room was locked when we arrived and though we reported it, they never got around to opening it. The initial check-in clerk wanted payment on arrival, but he didn't know how to use the cc machine for our non-chip credit card. The WiFi couldn't be received in our room though it is advertised as being available everywhere. Very friendly owner. The decoration is unique and it has a very good location. No wi fi in the room!!!!!!!!! !rooms with street view are very noisy!!!!! 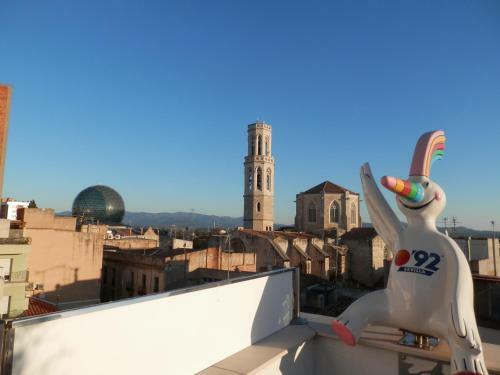 Centrally located for all the major museums in Figueres. Comfortable room with small private terrace. An excellent and reasonably priced buffet breakfast. The church bell close by rings every quarter of an hour and is very loud! Being overcharged for breakfast that poor with stale croissants and mouldy bread. Great location, super-friendly staff, cosy and original hotel. pleasant staff and a clean room with free wifi. door wasn't working so you had to wait for someone to open it for you every-time you came in or out. No hotel parking,have to pay extra 10 euros to park with a company they have a deal with. Everything! 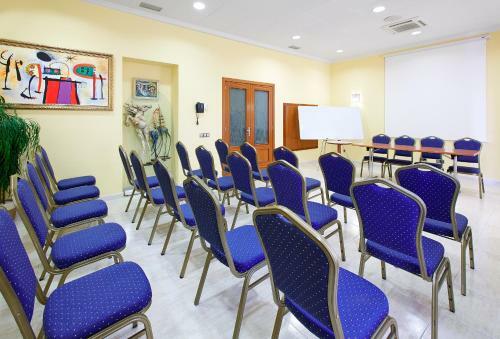 Artsy, great location, great staff, beautiful setup, great wi-fi, price, etc. Good hotel with exquisite interior. Very close to Salvador Dali museum. Quite cheap. We requested a double bed and a single bed but after check in found 3 single beds in the room. The personnel can't answer standard questions about sightseeing and local stores. Good location near Dali museum. The hotel was decked out with beautiful art and circus decorations on the walls of the rooms, stairways and the foyer. The staff were very friendly and willing and showed pride in their hotel and town. We were able to walk to the local rail station to catch a train to the nearby beach for the afternoon.. Staff were happy to keep our luggage in storage after check out so we could visit the Dali museum unencumbered. a man at the reception was harismatic, kind and smiling ;)). I hope he reads this and forgive us for not understanding. What a delight! The staff, the location and the chic. The sardina BBQ on Saturday night, complimentary for hotel guests, was fab..sitting in a Dali inspired boat eating the most gorgeous food under a summer sky with the cathedral spire floodlit and chiming..could there be anywhere else??? Design of the hostel is a bit crazy and kitschy, but really fun, especially horses in the balconies. Very comfortable and clean, air conditioned, with huge bed. Beautiful views from the roof terrace! Location is perfect. This stay was absolutely splendid! I have no complaints. The hotel is one of a kind. All the walls are covered with original art that guests from around the world have donated. Each room is decorated in its own odd style, and the amenities are great. Tasty continental breakfast, good water pressure, comfortable mattress & pillows, little balconies in some units to let in fresh air, and easy control of temperature for those hot Spanish summer evenings. Conveniently located right next door is the Café Versátil which, as the name implies, serves everything from gazpacho & tortilla española to paellas to kebab pizzas to Italian pastas to all sorts of tasty desserts. The service & prices there are superb in addition to the quality of the food- which, though not exactly gourmet, was just what this weary traveler was looking for after a day´s journey from Barcelona. The gazpacho, I will note, is homemade and very delicious, refreshing. The hotel staff are its best feature. Everyone I interacted with was very friendly & warm, particularly Joaquin the proprietor. He invited me to share several beers with him, told many stories of his fascinating past (his main enterprise in life is an amusement park ride manufacturing company that ships all over the world), and even took me along for a few errands around town & showed me the countryside. Whether or not you have the privilege to spend such time with him, you will surely get a glimpse of his generosity at some point. Case in point: every Saturday he throws a free BBQ for all his guests on the rooftop terrace, giving out kilos of shrimp & sardines and liters of Estrella like the world knew no tomorrow. Oh, and finally, the Dali museum is right next door. 10 out of 10 for the Hotel Plaza Inn. I was actually kind of sad checking out today and hope to return at some point in the future. Book a room here! Do it. 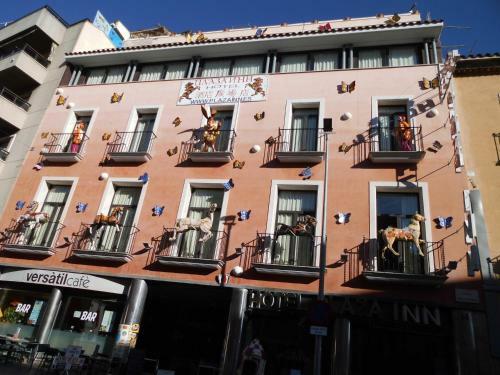 Very fun hotel - a few paces from the Dali Museum and right downtown. The owner is very friendly - you need to speak a bit of broken Spanish to communicate- but during the summer he throws parties for the guests every Saturday night. Wild decorations in the Dali-esque style. It's very near from Dali Museum and some restaurants. Plaza Inn was a reasonable walking distance from the bus and train stations and almost next door to the Dali Museum. The room was large, the bed huge and comfortable, the bathroom clean and bright, staff helpful, lift working. We didn't eat there so can't comment on their breakfast. There's an excellent bar/restaurant 50-100m down the street (left out of the hotel door) called 'Meson Asador'. Avoid the cafe on the corner between it and the hotel - they make lousy coffee and mislead with their advertised prices. We liked Figueres. Reviews all seemed to say there's nothing to recommend it except the Dali Museum but we disagree. There's a good vibe, interesting streets and architecture, varied shopping and a huge fresh produce market, and a fortress a short walk from the centre. I feel they made a mistake with their theme park decor, which would probably earn it few fans. Tip: don't come home drunk, wear dark glasses if your eyes are sensitive. Excellent location just around the corner from the Dali museum. Many cafes and restaurants in the vicinity. Funky decor. Personnel very friendly and helpful. Receptionist friendly and helpful. Excellent location. Air conditioning didn't work and made funny noise but we did not advise them of this issue. We chose this hotel for its location near the museum but found the hotel staff very helpful for all kinds of information. The room was large, clean and the bed quite comfortable. And the museum was literally just down the road. 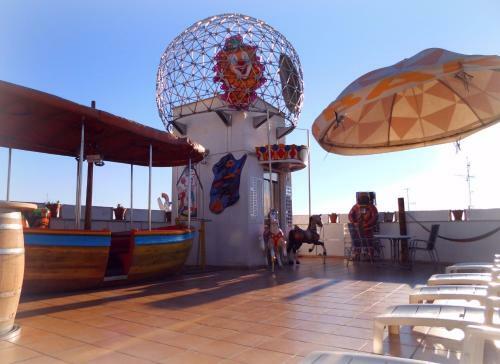 We especially enjoyed the carousel horse on the balcony. Perfect locations. Good wifi. Fantastic design - frivolity and kitsch!